At the invitation of the National Assembly of Malawi, a delegation led by Hon. 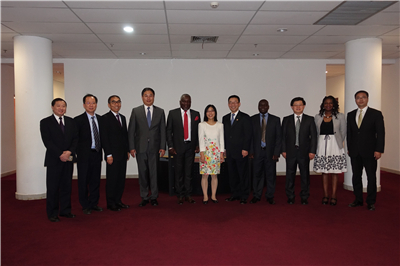 Mr. Chen Guomin, Vice Chairman of the Foreign Affairs Committee of the National People’s Congress (NPC) of the People’s Republic of China, visited Malawi from 15 to 18 November, 2018. During the visit, Hon. Chen paid a courtesy call on Rt. Hon. Richard Msowoya, the Speaker of the of the National Assembly of Malawi, held talks with the International Relations Committee of the National Assembly of Malawi, and met with Malawian Government officials. The two sides had exchanges of views on further developing China-Malawi relations and major international and regional issues of common interest.